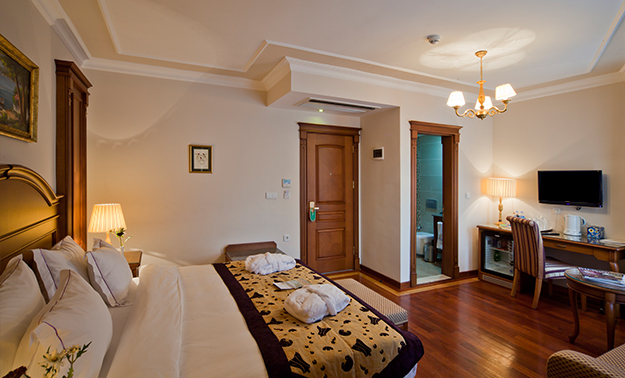 Enjoy a luxurious night's sleep in one of our One room Deluxe Rooms!16 - 18 squaremeter room. 1 Queen bed or 2 twin bed. Premium bedding,Working desk. Parquet floor,Light decor and antique-style furnishings. Satellite television, Internet access, climate control, complimentary wireless Internet access. Telephone in bathroom, Clock radio. Minibar, tea and coffee facilities, safe, complimentary bottled water. Designer toiletries, bathrobes, slippers, jacuzzi bath tub, hair dryer. Deluxe hot continental breakfast included. Enjoy a luxurious night's sleep in one of our One room Junior Suites! 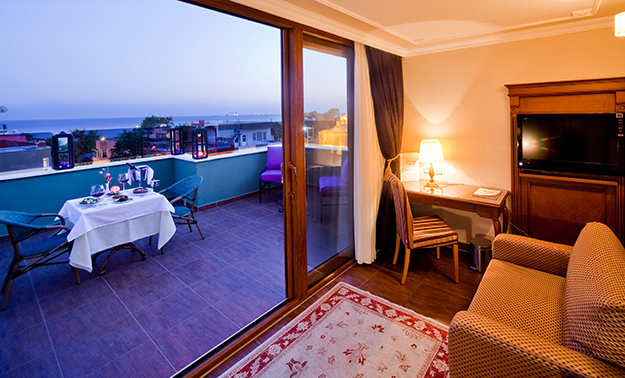 Each room comes with comfortable sitting areas. 1 Queen bed or 2 twin bed and two sofabed. Premium bedding,Working desk. Parquet floor, Light decor and antique-style furnishings. Satellite television, Internet access, climate control, complimentary high-speed wireless Internet access. Telephone in bathroom, Clock radio. Minibar, tea and coffee facilities, safe, complimentary bottled water. Designer toiletries, bathrobes, slippers, jacuzzi bath tub, hair dryer. Deluxe hot continental breakfast included. Enjoy a luxurious night sleep in one of our spacious Connected Suite. 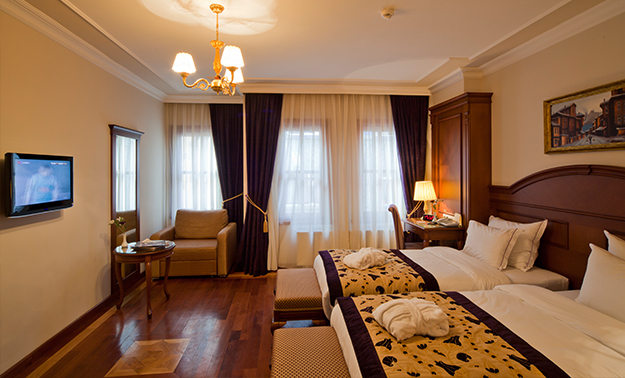 In all Connected Suites existing 2 bedrooms with very comfortable 2 Queen Size Beds or 4 twin beds and 3 sofa beds. Totally 7 people can accommodate. Existing 2 bathrooms. Fully marble decorated bathrooms includes jakuzi, wc, sprinkling shower and handled shower, hair dryer, make up mirror, decorative toiletries and bathroom phone. Premium bedding, working desk, parquet floor, in-room safe (laptop size), huge wardrope, direct- dial multi line phone, clock radio, well stocked minibar, complimentary bottled water, types of tea and coffee, tea – coffee maker, three 42-inch flat screen LCD TVs and one 37-inch flat screen LCD TV , bathropes and slippers are for some of the amenities for your comfort in all Connected Suites. We serve unlimited high speed wired – wireless internet complimentary and satellite service which includes hundreds of premium tv channel, audio system in bathrooms and bedrooms, air conditioner and controllable central heating system in all rooms. Please note that all types of reservations include rich variety open buffet breakfast and exclusively usage of SPA.